This was originally an instagram post then turned up in my Newsletter but just in case you had trouble find it. Here is my Summer Reading List. It is long and I might need a few light reads to break it up (suggestions welcome) It may take me until Fall or even longer but let's see how I do. Feel free to read along with me from anything in the stack. I would love to know what you have enjoyed and what you are reading now! 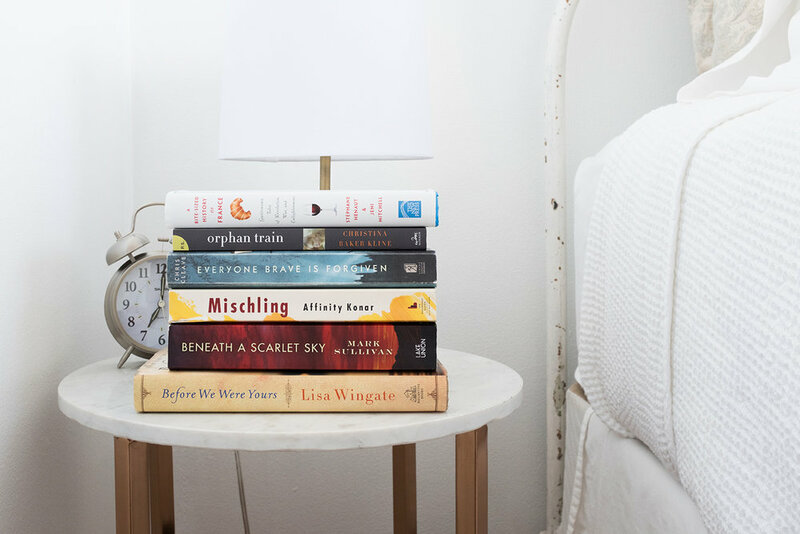 Some books that aren't pictured that arrived after I shot this are "Les Parisiennes" which was a reader recommendation and also "Why We Sleep" Just looking at the index on this book had me intrigued. I started with "Beneath a Scarlet Sky" my friend gave it to me to borrow and she couldn't stop talking about how good it was. She keeps asking where I am to check my progress and discuss. "A Bite-Sized History of France" Gastronomic Tales of Revolution, War, and Enlightenment was sent to me. I have only read little so far. It is great to read a chapter at a time that focuses on a different topic. "Orphan Train" This was given to be by a friend. Has anyone read it? I have heard good things! "Everyone Brave is Forgiven" I don't know much about this one. I will report back. Also from my friend. "Mischling" My friend raves about this one. She gave me a big stack as you can see. There you have it! My long list of Summer Reading. I will keep you posted on how I am doing and I hope you will decide to read along with me on one of these books. Jessie Kanelos Weiner shares her top 5 Parisian addresses. She will making a tour between NYC, DC, and Chicago for her new book, Paris in Stride. You will find me at the Chicago stop on April 7th, at 57th St. Books moderating a discussion with Jessie. I would LOVE to see you all there! You will find me at the Chicago stop on April 7th, at 57th St. Books moderating a discussion with Jessie. I would LOVE to see you all there! There are a few places in Paris that are equally local and super touristy, but Palais Royal hits the sweet spot. Most of the tourists are impersonating flamingos up front on the black and white Colonnes de Buren. While the gardens and arcades behind still have a timeless Parisian calm. 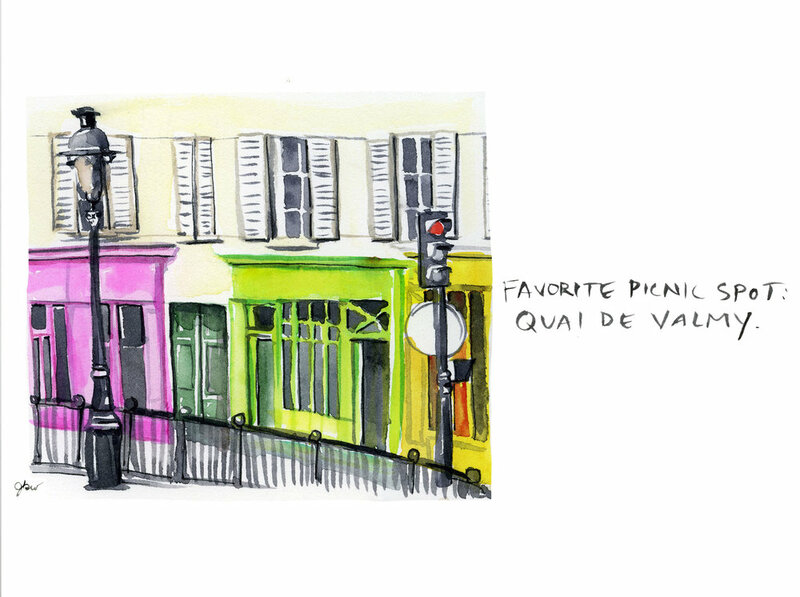 This is my favorite destination in the warmer Parisian months, perfect for people watching and competitive picnicking. Favorite Cheap eat: Miznon. This Israeli outpost is impossibly noisy, vegetable strewn and overpacked. But it's all worth it for the ratatouille served on a generous bed of tahini. And everything is finger-licking good. 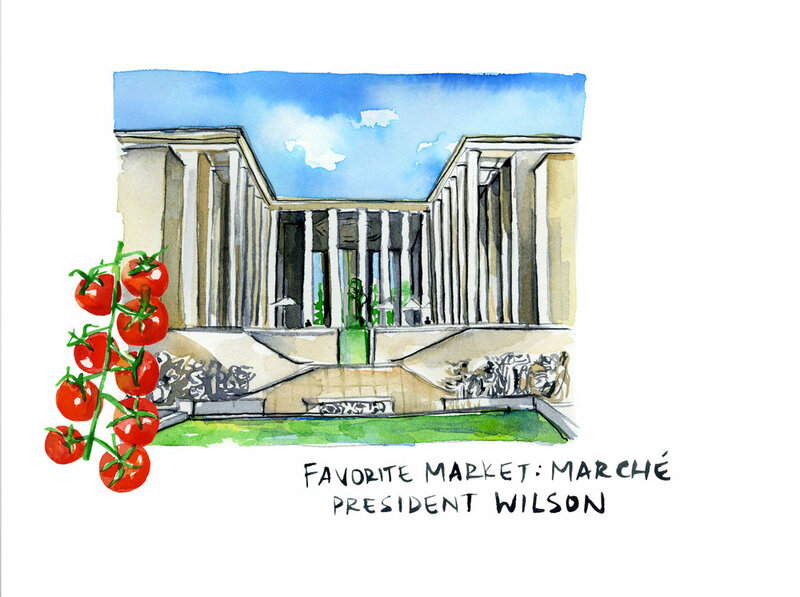 Marché President Wilson Paris: Nestled between three of my favorite museums (Palais Tokyo, Musée d'art Moderne, Palais Galleria) with a a spectacular view of the Eiffel Tower, this market will make anyone channel Julia Child with its drop-dead gorgeous selection of French ingredients. I love this excellent neo-bistro with classic French faire, natural wine and a friendly neighborhood feel not far from the pantheon. Who will be catching Jessie on her book tour this Spring? Is anyone planning to join in Chicago? Comment below! This month's book club book "Tasting Paris" is a little different than the usual selection. It's a cookbook by author Clotilde Dusoulier of Chocolate and Zucchini. I really wanted to do a cookbook of the month on top of the normal book club, but I knew I was stretching myself a little thin. In last years survey, there were so many of you who requested more recipes. When I saw Clotilde was doing a new book, I knew it would be a book club book, but I had to read through it before making the final decision. (I do this with all the books) The minute it arrived, I dug in reading the stories and ear marking new recipes to try. "Tasting Paris" is a collection of 100 Recipes to Eat Like A Local. Each recipe comes with a little history lesson or significance behind the recipe and is accompanied by the most beautiful photographs taken by Nicole Franzen. The book is divided into Chapters to take you from the Morning, Afternoon, and Evening with recipes for each. When I asked Clotilde which her favorite recipes from the book were, "Let’s see -- favorites from the book… It’s like choosing a favorite among one’s babies, but I really like the potato chip omelet (! ), the fish beurre blanc, the devilled avocados, and the Nantais cake." I was intrigued by the Radish Leaf Pesto recipe. I don't eat very many vegetables, but I do love radishes. They are a weekly staple for me from the grocery or market. Until a friend pointed out, I had no idea you could eat the radish leaves. I always felt guilty throwing them away. This recipe is a perfect way to use the leaves. I use radishes in my salad or on avocado toast with lemon and olive oil. I kept some in the fridge and dug into the leftovers cold, it was SO good. I have a thing for cold pasta or any kind of pasta really. For the recipe, I used comté and almonds. You have the option to use pine nuts/pistachios and parmesan cheese instead. This is just what I had at home and I wanted it to be simple. You can spread this on toast or I tossed it with some fusilli for dinner last night. It was SO good. I know I will be making this again soon. For the full recipe you can find it in her book "Tasting Paris"
I have a been a big fan of madeleines every since I dined at a restaurant in Paris that brought them out warm from the oven and directly from the tray. I love making these at home and I have tried a few different recipes over the years. In "Tasting Paris" there was a recipe that used Earl Grey tea. You can substitute the tea type as a variation. I used Palais des Thès Rooibos. I always pick this one up when I am in Paris. You can purchase it online if you live in the States. They sell a big variety at Nordstrom now and it made me so happy to see this as an option. I promised myself I would only eat one of these before shooting them, but it quickly turned to two. Fresh out of the oven and a warm cup of tea on a cold day is the perfect fix. Try it for yourself! As you read through the book, "Tasting Paris" I can't wait to see what recipes catch your eye and which ones you decide to try in your own home. This is a perfect way to bring Paris into your every day life. Comment below and share your favorite recipes! If you post on social media, please tag #tastingparis so we can see the recipes. I still have a good amount of recipes I want to try from this book including the potato chip omelette and the profiteroles. This post does include affiliate links which helps contribute to my coffee and croissant research in Paris. Merci! At the start of this year, I set off to start a book club. It was just me, I really had no idea how many people would join or if anyone would be interested. The idea was to unplug from technology and start reading again. Last year, I went from reading one book and now here I was setting out to read twelve or more. There are no rules for the book club. I have had a lot of people ask how to join (it is virtual) bonus points if you encourage a friend to read with you. After each book, I would typically pass it off to another friend to read. My Aunt in Ohio has been in on the fun! This past year I have had a few meet ups, but we never really chatted about the book. Not everyone reads and that is okay. The meet ups were for us to get to know each other better and hopefully walk away with a new friend or two. I have been lucky to to have met so many of you all this year and to build new lasting friendships because of this blog. I have plans for a Facebook Group for 2018 that will allow you all to connect in each city and create your own coffee dates. I really can't wait to watch this community grow. The book club started out with "Bonjour Kale" by Kristen Beddard. I have literally been on a kale kick all year. I am known for finding a food and eating it over and over (sushi, baguettes, chocolate) but I have joked in the past I am allergic to vegetables. I get that one from my Dad. Kale, was a big step for me. I followed the kale massage and share it with friends and strangers on a regular basis. I typically eat my kale in a salad with lemon and olive oil. The vendor at the local farmers market would see me at least once a week filling my market basket with kale. If you haven't tried it, trust me. If I had to choose one book that impacted me the most this year it was, "The Nightingale" it had been on my kindle for over a year and I kept skipping it. After I read "All the Light we Cannot See" I was in a complete book hangover and picked up "The Nightingale" I could have read it in two days but I didn't want it to end so I dragged it out. When it finished, I sobbed. If you haven't read this book please read it. Kristen Hannah is one of my favorite authors before this book and I think she did a fantastic job with the story and the history. A crowd favorite was "The Perfume Collector" this was recommended by a good friend of mine who trained as a perfumer. It sat on her book shelf and the cover caught my eye. It sparked my interest in learning more about the perfume world. It is beautifully written and has made me think differently about Paris when I walk the streets. I am always looking at old store fronts and trying to imagine the history and stories that they hold. One part of the book club, I didn't expect to happen but so happy it did, was being able to connect and build relationships with the authors. Kristen Beddard of "Bonjour Kale", Amy Thomas, of "Paris My Sweet" and new author of "Brooklyn in Love" and Ann Mah of "Mastering The Art of French Eating" and her newest book coming out "The Lost Vintage" were all in attendance at the Ladurée meet up in New York earlier this year. Keep an eye on these three for future projects and Ann and Amy's new books in 2018. So what happens next? Over the last year, the book club has been growing and I have introduced people to new books all over the world. It seems a bit crazy but I am going in for round two. I have been incredibly fortunate that I am getting books sent to me as consideration for the book club. One that I will be reading hasn't been released yet, but it is a good candidate for January. I try to read every book in advance or at least enough to know if it is a good fit for my audience. Of course not every book is going to be everyone's favorite and that is okay. But to get people reading and talking about books is the end goal. I can't thank you enough for joining me on this year of books with me. I do have one book from Ann Mah, "Mastering the Art of French Eating" I want to put a book under someone's tree this year so the cutoff will be short. Comment below and tell me your favorite book you read this year. Also, please include your city and email so I can contact you. If you have book recommendations for next year, I will gladly take them!! The latest book club selection is, "The Designer" by Marius Gabriel. The book is set in 1940's Paris after World War II. Copper Reilly is photographer and reporter in Paris who is there on assignment with her husband. She is stuck in an unhappy marriage and eventually separates from her husband. She meets the designer, Christian Dior before he designs his first collection. Copper struggles to find who she really is and who she truly loves in a self discovery process. (There is some adult content that may not appeal to all) You can easily skim over this as it isn't a huge part of the overall plot. The history of Christian Dior is true and I found it fascinating. He designs "The New Look" and also highlights the story of his sister who he was inspired by and creates the perfume, "Miss Dior" for Catherine Dior. You can read more about it with this article. The book was just recently released but already getting great reviews. I would love to know what you think! Book Club : October Selection "Mastering The Art of French Eating"
Book Club Suggestion September: "The Only Street in Paris"
Book Club: Let's Discuss "All The Light We Cannot See" and "The Nightingale"
Book Club Selection August : "All The Light We Cannot See"
Introducing the October Book Club Selection "Mastering The Art of French Eating" by Ann Mah. I first found out about this book a few years back and I read it just before a trip to Paris. I loved the way Ann wrote about Paris and after spending so much time in Paris year after year this book really gave me a lot of back story on French Cuisine. From Steak Frites to Aligot (one of my personal favorites) Ann will explain the history and significance behind 10 French dishes. If you have ever been to Paris with me or given the "Rebecca Plotnick Tour of Paris" I always involve food and I am full of random facts about Paris. I pride myself on collecting them over the years. I owe a good amount of my food knowledge to my weekly trips to the markets and "Mastering The Art of French Eating"
Paris can be a very lonely city especially when you don't know the language. I instantly felt a connection to Ann through the book as she struggled with the French language and the way it felt when she could actually join and carry on a conversation in French. I recommend reading the book chapter by chapter one at a time. Each is a story in itself. Note: Read on an empty stomach because I can guarantee you will get hungry. Ann says it best, "The story I tell here is of ten different regions of France and their signature dishes, of the link between history and place, culture and cuisine. I chose these ten dishes and regions because of their significance in the United States or, as is the case with Averyron, because of its significance with me"
I first met Ann at The American Library in Paris not long after I read the book. I had just arrived on a flight from the US and I knew she was hosting an event. I pushed my jet lag body and arrived by myself feeling completely out of my comfort zone. The American Library in Paris plays a part in "Mastering The Art of French Eating" so I felt it was a bit full circle. I stood in the VERY long line just so I could meet Ann and tell her how much I enjoyed the book. I remember passing her my card and mentioning that I would love to work with her one day. I wasn't quite sure how but I wanted to put the idea out there. If you remember earlier this Summer, I hosted an event at Laduree with a group of authors, Ann Mah was one of them. I was delighted when Angie, "Bright Lights Paris" suggested the idea to include Ann. One of my favorite parts of The Every Day Parisian book club has been not reading and hand selecting the books but interacting with the authors. Kristen Beddard of "Bonjour Kale" and Amy Thomas of "Paris My Sweet" were also part of the Laduree event this Summer and it was so much fun hosting with all of these lovely ladies. For those of you have been to Paris, planning a trip to Paris, or have never been but enjoy French culture I highly recommend "Mastering the Art of French Eating" There is a bonus at the back of each chapter as Ann includes a recipe that is relevant to the cuisine featured. I will leave you in the words of Ann Mah "It changed me, of course, living in France - Julia Child could have told me that it would - even though, like a lot of big things, the change crept on me little by little. Bite by bite. Which, I suppose, is the only way to savor life"
My first apartment in Paris was in Montmartre. I lived just a few minutes away from Rue des Martyrs and would find myself passing through to pick up a baguette or just to stroll on my morning or evening walks. When I first found out about the book "The Only Street in Paris" I was intrigued. The story takes the charm of Montmartre and focuses on just one street Rue des Martrys. The author Elaine Sciolino, an American in Paris, takes you through the history and stories of the street broken down in each chapter as you are joining her on a personal walk with just her. From the first chapter of "The Only Street in Paris" I was immediately hooked. When I am back in Paris next week I can't wait to walk the streets of Rue des Martyrs knowing the secrets and stories that this street holds. It already holds a special place in my heart but now it has more history. If you can't make it to Paris anytime soon enjoy this book one chapter at a time and you will be taken on a literary journey. This post does include affiliate links which puts a little money in my pocket for coffee and croissant research. Merci! I originally chose the book "All The Light We Cannot See" for the latest book club choice. I loved it. It gave me goosebumps and left me in tears. It was a beautiful story. I literally was in book hangover until I was recommended to read "The Nightingale" now I am currently in double book hangover and I am telling you it doesn't feel good. The Book Club is "virtual" as this blog has followers from around the world (THANK YOU) I host meet ups but I never want to put pressure on people to read a book so they are more of a Francophile gathering to meet other new people. I would love for this post to be a discussion. Feel free to comment on other people's posts below. I would love to start a discussion between all of us on these two books. I won't say much except history repeats itself. It is so important to know the past and remember what has happened even if the story is painful or sad. While I loved "All The Light We Cannot See" I felt more connected to "The Nightingale" I love Kristen Hannah's books and it read easier for me. Also having a sister who is so different but still my best friend made this book more relatable. I would love to know your thoughts if you read one or both. I highly recommend both of them but not everyone has time to read 1000 pages. The idea of the book club came about because I had only read one book last year. I wanted to read more and encourage others to do the same. Putting down a device at night before bed has really improved my quality of life. I would love to know your thoughts on the books below. Well, it took a while because this month's book is a long one but I am happy to say I have another recommendation and a book on the book stack. When I started the Book Club in January I have always asked for suggestions on what to read next and "All The Light We Cannot See" was probably the most recommended book. I can now see why. I don't know where I was when this came out and I am not sure why I waited so long to read it. The story is touching and beautiful and gave me goosebumps and made me cry in one sitting. The minute I finished I wanted to read it all over again. The ending answered a lot of questions but led me to more. If you are thinking that the book is lengthy the answer is yes, it is long but it goes pretty quickly. I started reading it on my way to Portugal and my travels throughout Europe. I will say, don't put it down and pick it back up weeks or months later you will loose part of the story. You want to carve out time for this one. The book is about a blind French girl and a German orphan boy whose lives intertwine as they are trying to survive during the World War II during the Nazi Occupation. The story bounces between one character and the other as you learn about the characters. Marie Laure lives with her father in Paris she goes blind at an early age. Her father builds her a model of their neighborhood with every little detail down to the manhole so she can navigate the city. When the Germans occupy Paris the two flee to Saint Malo where they stay with Marie Laure's great uncle and caretaker. In Germany, Werner an orphan lives with his sister Jutta. Werner finds a passion in the discovery of fixing and building radios. His talent finds him in a spot in the military and a part of Hitler Youth which brings him all the way to Saint Malo. For those of you who have read this book or have this on your reading list, this is one I would love to discuss. It is lengthy and I am sure every one of us had different parts that tugged at our heart strings. Feel free to comment below if you have read the book and your own personal thoughts. If you haven't read it yet please tell me where you follow from and I have one copy that I will send a reader next week. Thank you so much reading along. Feel free to pass this list off to any Francophile friends that are in search of a good read. For Chicago people there will be a meetup this month I am working out the details now and will have a date soon! We are in the 7th month of the year which also is the 7th book of the book club. This month my selection is "A Paris Apartment" by Michelle Gable. The story is inspired by a true story from Paris. In 2010 a Paris Apartment was discovered untouched for 70 years. The apartment and all its contents from the Belle Epoque including a Boldini painting are rich with history. Marthe de Florian the owner of the apartment fled for the south of France just before the Nazi occupation of France during World War II leaving behind a time capsule telling the story of her life. It is in the letters that were found on the vanity of Marthe de Florian that share some of the secrets of her past. The author Michelle Gable uses the apartment and letters as inspiration to write the story behind "The Paris Apartment" creating a story behind Marthe de Florian and her life. April Vogt is a furniture specialist for Sotheby's and is sent to Paris to catalog and set the contents of the apartment for auction. April is enchanted with the story of Marthe de Florian and is able to identify the unsigned painting in the apartment as a Boldini. April discovers the letters left behind and starts to uncover the story of the past. It isn't just about the furniture and what has been left behind in the apartment but the story of the woman that lived there. The story moves between the present and the past and tells the story of both Marthe de Florian from the early years until her death and April in present time discovering each piece by piece. When I first heard about the book I put it on my reading list and quickly dove in. I read on the plane on the way to Portugal and then again on the train where I finally finished the book. I mistakingly left the book on the train as we left in our hurry for our stop. I didn't know the history or story behind the book until after it was finished. Now I can look at the photos of the apartment and the Boldini apartment and see what inspired Michelle Gable to write the book. Even if you have read the book hopefully this will give you a little glimpse into the apartment if you didn't know the photos existed. Upon further research, (architectural digest article) I discovered the book "The Velvet Hours" was based on the same apartment so if you prefer to read that one you can. I would love to read them both and see the differences in the stories from the authors. There is no right or wrong story as we will never know the whole truth. Have you read "The Velvet Hours" or "A Paris Apartment" I would love to know what you think. If you enjoyed "The Perfume Collector" I think you would enjoy "A Paris Apartment"
Comment below and tell me where you are spending your Summer I will send one reader to receive a copy of their own to read "A Paris Apartment"
Amy Thomas of "Paris My Sweet" The June book club selection and one of the authors from this week's Ladurée event shares "New York to Paris and Back Again"
I recently got my bike tuned up and took my Café Racer out around Brooklyn. It’s no Velib, but it sure did unlock a memory well. As I pedaled along the avenues and coasted through side streets, feeling free and invigorated, it brought back some of my happiest memories of living in Paris. It’s almost like a dream now. It was eight years ago when the agency I worked at approached me with the opportunity to transfer to the Paris office. One phone interview, a few months and a ton of paperwork later, I was packing up my one-bedroom apartment in New York for a new life in Paris. I traded bagels for croissants, cupcakes for macarons, and said adieu to my big, beloved network of friends, family, colleagues and freelance contacts. I was starting over. I would never have been so bold had it not been to move to the most beautiful and magical city on earth. My commute each day was hopping on one of those Velibs, the city’s public bike-sharing system, and pedaling through the Place de la Concorde, and up the Champs-Elysées to where our office overlooked the famed Avenue. On weekends, I explored other French towns and cities such as Lille, Nantes, and Biarritz and every season took a vacation (Vive la France and its generous vacation policies! ), visiting the likes of Brussels, London, Capri, and Lisbon. What more could you ask for? But it wasn’t all a fairy tale. My time in Paris was, in reality, a mélange of fantasy and loneliness. Euphoric highs tempered by existential questions. Fabulous fashion, freedom, and food, tainted by maddening bureaucracy, illogical rules and plenty of lost-in-translation moments. There were enough doubts and discomforts in my mind that I ended the affair not even two years in. It’s now been six years since I moved back (how did that happen??). It was actually a tough transition coming home, as I felt stuck between the love for two cities. But little by little, I regained my balance and now appreciate both cities without feeling torn between the two. I love New York for its scale, energy, passion, noise, possibility and mythology, and Paris for its grace, romance, charm, sophistication, and history. I love New York’s skyscrapers, brownstones, yellow cabs and a high-powered grid of avenues and streets, and the hotels particuleurs, hidden courtyards and grand tree-lined boulevards of Paris. I love the bakeries, delis, corner bodegas, pizza joints, cocktail bars and pretzel carts of New York, and the outdoor markets, comptoirs, cafes, chocolatiers, patisseries, boulangeries of Paris (man, do I miss those!). Being back on a bicycle, remembering all those Velib rides so vividly, made me realize once again how lucky I am: to have called two of the greatest cities on earth home and to still carry them each in my heart. In "Paris, My Sweet" Amy Thomas who lives and works in NYC dreamt of living in Paris after a study abroad experience in college. Her job as a copywriter at Louis Vuitton gave her the ticket to make her dream a reality. The first six months were pure bliss riding around on the city on her bike, exploring new pastry shops, and admiring her picture perfect view from her rooftop terrace at work. She shares her love of Paris with her Mom and stepdad on their first trip abroad as they bite into warm fresh croissants and visit all the Paris monuments in the city. After signing on for an extended nine months in Paris Amy sets home for two weeks to visit family and friends. The same friend's that were her core group of people who she bonded with over sweets, the single life, and work now felt foreign to her. Her single friends had suddenly coupled up and the city changed. It wasn't just that the city changed but she had changed too. "I kept pondering where all these observations left me" with two homes or none? Was I a New Yorker or a Parisian? Expat or local? Where exactly did I belong? As I searched for the connection to and love for a city that had always sustained me, I felt sad and alienated" Amy Thomas "Paris My Sweet"
I haven't been shy about my own personal struggles on where I belong between Paris or Chicago. This book really hit home for me and as I have now read it for the second time has become a comfort knowing that someone has had the same feelings of not quite fitting in and the growing pains of living abroad. I wish I could share more but I want you to pick up the book and read to find out what happens to Amy and her life in Paris and New York City. The story may leave you hanging as she wrote the book a few years ago. Not to spoil it but there is a happy ending to the story. The best part is if you are in New York City you can meet Amy Thomas at the Ladurée event June 14. There is a simple reason why I chose "My Life in France" as April's book club selection. April happens to be my birthday month and I turn 35 next week. I find Julia Child's story to be inspirational and love that she found a passion for cooking later in life. She was a woman that was filled with determination, hard work and she was a francophile. As I read her book this past month I kept thinking how different her journey would be if she had the tools of social media and the internet. She would have had an amazing blog and youtube channel. She didn't have any of these tools. She sent her corrections and recipes to her co-authors, friends, and publishers. She had way more patience than I think I will ever have. She didn't give up on her dream of teaching people how to cook way through her recipes. I found my passion for photography years ago but it wasn't until I lost my job in 2008 that I had the push to chase my dreams as a travel photographer. I hope I can motivate you to follow your passions whatever they may be through the blog. I hope you enjoy Julia Child's book as much as I did as it takes you to Paris, The South of France, and back to the US and inside her kitchen as she works on the recipes for her book "Mastering the Art of French Cooking"
The book is written by her husband's great-nephew Alex Prud'homme and is based on letter's Paul would send to his twin brother Charles over the year's. The idea started in 1969 after Paul suggested creating a book from the letters. For one reason or another, the book got pushed to the side and never got written. Julia never gave up on the idea to write the book and saw it as a tribute to her husband Paul, "the man who swept her off to Paris in the first place" My Life in France. It took until Julia turned 91 that she asked Alex for help on writing her story. They worked together and she shared memories through conversations over a good meal or a car ride. Two days before her 92nd birthday Julia Child passed away from kidney failure. Alex Prud'homme carried on the memory by finishing the book. I have really enjoyed cooking but I have never picked up "Mastering the Art of French Cooking" I just ordered it on Amazon and I can't wait to dig in and cook from her book of recipes. After reading how much work and time was put into building the book I am more interested in trying the recipes than ever before. For this next book Giveaway, I would love to know your favorite recipe to cook. Bonus Points if it's French. I would love a way to connect all of you from around the world to meet for coffee/ wine to discuss the book or just meet other Francophiles. If you have any ideas I am open to it! Please leave your email address and the city you currently live in with your recipe! After reading this month's Book Club Selection The Perfume Collector I have an increased interest in the perfume world more than I ever thought I would. One of my very dear friend's Alexis is a trained perfumer so we have done our fair share of talking about scents over the years. Rose is one of my all-time favorites so I was very excited when Sisley Paris came out with a new fragrance Izia centered around the rose. I asked Alexis to highlight some of her favorite Rose perfumes for Every Day Parisian. Rose is at once both a daunting, yet comforting fragrance profile. It was the very first family I studied as I delved into perfumer training, spending almost six months immersing myself in its mysteries. While I diligently worked to understand its many and distinct varieties and experimented with the numerous raw materials that yield its unmistakable scent, the work that truly spoke to me was my research soaking in the history of iconic rose fine fragrances. From classics like Chanel No. 5 to Joy by Jean Patou, the power of the rose transcends time. Chanel No. 5 features the rich, sweet May Rose, cultivated in Grasse, France. It is a hybrid of the French rose and the hundred-leaved rose. The lush floral bouquet of Joy by Jean Patou features 28 dozen May Roses. (WARNING: SPOILER ALERT) Not only are these two timeless fragrances associated with the fundamentals of the rose family, but they will also make a reappearance in future Jasmine and Ylang-Ylang fragrance guides. To be honest, in my studies I personally was not attracted to these particular fragrances; they seemed overwhelming, overbearing and a bit old fashioned. As I continued over the months, I acquired a deep appreciation for the art and refinement that makes up these fine fragrances. But my real interest in the lovely rose really peaked when I learned about Stella by Stella McCartney. Stella changed my world. I may have FINALLY found a fragrance I could (somewhat) commit to. When I first evaluated this fragrance, it immediately felt complex, yet extremely new. It was obviously floral, but extremely feminine, powerful and new. The rich, potent rosy fragrance makes it feel as if you’re stepping into a rose garden of deep, lush pink roses at dusk. The rose notes linger and bring out a touch of spice at dry down. Chloé is another brand that showcases subtle nuances of the rose. The brand spans from Chloé by Chloé’s powdery, classic rosy fragrance to Roses de Chloé’s lovely, fresh modern rose. Louis Vuitton’s much awaited and now recently launched perfume collection features Rose des Vents as one of its seven fragrances. It is described as a light, airy, sparkling fragrance that pays homage to the classics, made up of the May Rose along with two additional roses. Izia, the newest launch by Sisley, is inspired by and structured around the Rose. When designing the fragrance, owner Isabelle d’Ornano was drawn to the memory of her family’s rose garden. This floral scent showcases the feminine rose along with effervescent citrus hints and is rounded out with sweet, soft musk notes. Many US brands like Tory Burch Jolie Fleur Rose and Aerin Rose de Grasse have been inspired by this remarkable and classically French flower. Book Club: March Selection "The Perfume Collector"
I feel like I have been holding onto a secret with this one and I can't wait to finally share. This month's book club selection is "The Perfume Collector" I created the book club with the intention of encouraging people to put down their phones and read more. This month I found myself carrying this book around in my bag and waking up early just to read. It was such a delight. I really hope you all enjoy it as much as I did. The story takes place in London, New York City and of course Paris. The story is intertwined between two women, Grace Monroe a socialite and newlywed from London and Eva d'Orsey from Paris. One day a letter arrives from France that leaves Grace with an inheritance from Eva d'Orsey. For Grace, Eva and her identity are a mystery. Grace must go to Paris to collect the inheritance and sets out on a quest to find out who exactly Eva d'Orsay really is. The inheritance also includes an apartment overlooking Place des Vosges. Grace must look to the past to solve the mystery of Eve D'Orsay. The search takes Grace to a perfume shop on the left bank that is filled with a story spanning decades. The story is told flipping from the past to the present so pay attention it can get a little tricky. Eventually, the stories intertwine. I will say part of the story is predictable if you read it carefully but there are definitely some stories mixed in that you would never have expected. One of the really exciting things about this month is that I wrote Kathleen Tessaro the author of "The Perfume Collector" and she has agreed to answer questions!! I literally jumped in the air when I saw her email in my inbox. You will learn the more about perfume than you ever expected but the story left me curious to learn more. I have been wearing a signature scent for years but it was discontinued by Penhaligons and now the bottle is slowly coming to an end. For years I never wore perfume because I get terrible headaches but after living in Paris it was something I wanted to try again. I discovered the scent of Violetta and it brings so many beautiful memories. I am on the hunt for something new and different. Perhaps Jasmine or Rose? This month, for the book giveaway I am asking you to tell me your favorite signature fragrance. (if you have a suggestion for a future month feel free to include it) Please don't forget to give your name and email so I have a way to contact you.I will pick a winner for the book on Monday and one book will be added to the stack for the year-end giveaway of 12 books! Book Club : February 2017 "The Little Paris Bookshop"
Introducing the Book Club Section for February 2017 : "The Little Paris Bookshop"
There is something so comforting about a good book. I will admit before I introduced this book club I barely read in 2016. With today's current event's it's easy to scroll Facebook or get sucked into the news and go down the rabbit whole. With a good book, you feel as you have been transported and part of another story. Even if it's just for a chapter at a time. I was choosing between a few different books for this month but I wanted something uplifting and sweet and I heard so many great things about "The Little Paris Bookshop"
Monsieur Perdu owns a bookshop by the Seine and is described by the author as " A literary pharmacist who writes prescriptions for the lovesick" As customers enter his shop he asks them questions to get to know them and then recommends a stack of books based on what they need the most. The only heartache he can't cure is his own. Twenty years ago the woman he loved walked out on his life and he stopped living. She left him with a letter to read which he put away in a drawer and never read. That is until now.. I don't want to give too much of the book away but I am sure you will enjoy it! I can't wait to hear what you think. I set up a Good Reads Book Club Group. Kristen Beddard has a discussion in there from "Bonjour Kale" and we will start a discussion later this month for "The Little Paris Bookshop" There is no requirement for the Book Club, read at your own pace, encourage a friend/ family member to read with you, skip a book if you don't like it. 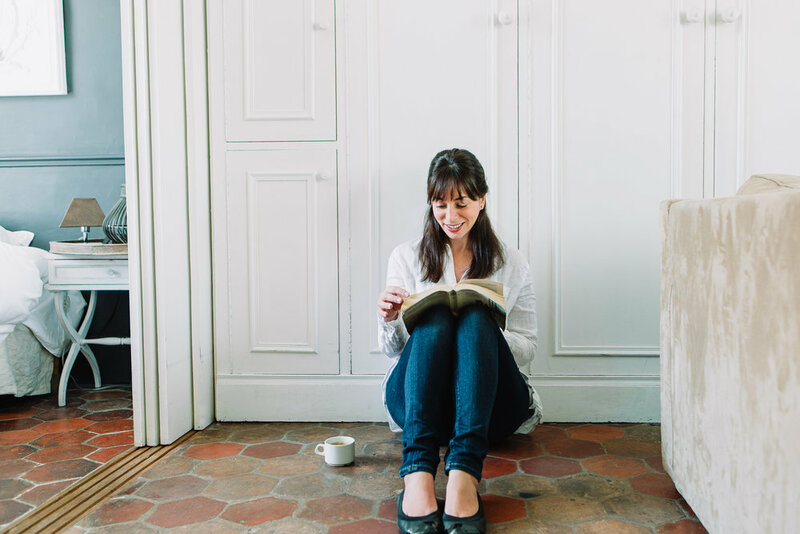 Welcome to the Every Day Parisian Book Club! I had the idea last year when I read The Paris Wife and I wanted to share the books that I was reading and make this site more of a community. So I figured why not make a book club? The idea is simple. Each month I will announce a book club choice that has a Francophile theme to it. Read it along with the online community and at the end of the month, I hope to share in a discussion. My hope is that you will encourage your friends to read along with you. My selection this month is Bonjour Kale by Kristen Beddard. Kristen and I were introduced by a mutual friend Lindsey Tramuta from LostinCheeseland Kristen moved to France with her husband not knowing the language and without a job. The reason I chose this selection is not just because it's the new year and kale is good for you. I will leave you to decide if you eat kale or not. Bonjour Kale is a love story, a memoir of an expat, part cookbook (kale recipes) and also shares the story of Kristen bringing Kale to Paris. For those of you who have dreamt of moving to Paris or who have moved to a city without knowing the language, you will instantly connect with Kristen and her challenges. You will be cheering her on as she finds her place in the city of Lights. As Kristen navigates the language and life in Paris she also finds her purpose in her new city. Each chapter finishes with a recipe using kale in traditional and nontraditional ways. Since I know Kristen personally, I thought it would be fun to create a Q and A about the book as well as life after the book. She was kind enough to say yes! Please email me questions bonjour@everydayparisian.com that you would like to ask Kristen as you read the book and I will put them all together in one post towards the end of the month for Kristen to answer. This month I am encouraging you to put down your phone on your train commute to work and stop scrolling before you go to bed. Pick up Bonjour Kale, be inspired by Kristen Beddard's story. There are a few ways to get your hand's on Bonjour Kale this month. You can pick it up at your local library, borrow from a friend, download it on your kindle ($2.99) purchase the hard copy from Amazon. I am giving away one copy of Bonjour Kale At the end of this post comment below with your recommendation for next month's book club pick with a French/Paris theme. I will choose a winner on Monday and ship out the book in time for you to read before the end of the month. My hope is to collect all 12 Book Club books and do a HUGE giveaway as a bonus at the end of 2017. Thank you so much for being a part of this community! I am excited to make this year more about bringing people together and growing this community offline. For those of you in Chicago, there will be a meetup towards the end of the month. You are welcome to bring the book and we can discuss in person!